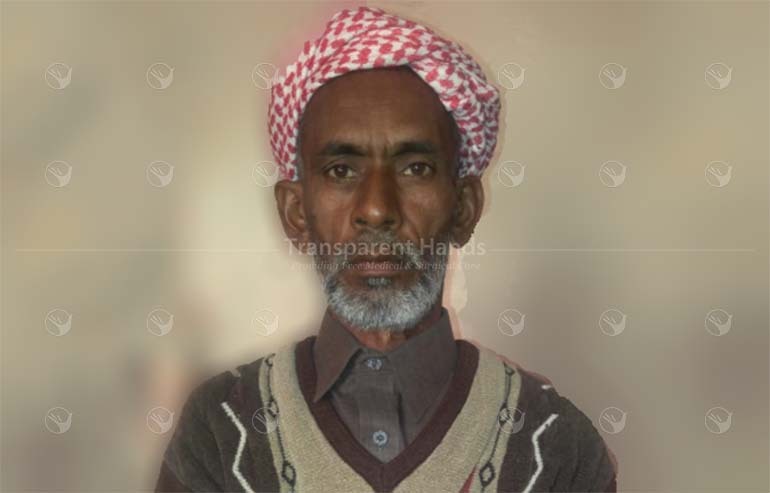 Nasir Iqbal is a 46 years old man working as a daily wage laborer and hardly earns 400 PKR a day. His average monthly income is 9000 PKR and within this meager earning, he manages a family of 8 members. He married 12 years ago and has 4 daughters and 2 sons. Nasir is suffering from Lt. Inguinal Hernia – a medical condition where the patient develops small bulge on one or both sides of the groin. For the last 2.5 years, he is experiencing pain in the groin especially when straining, lifting, coughing or doing any heavy work. The discomfort in his body improves when resting but he feels continuous weakness, heaviness, burning and aching in the groin. He has developed a swollen and enlarged scrotum which has made it difficult for him to do any work at present. It has been 4 months that he has stopped going to work. Nasir’s wife and children are living in misery. They don’t have any resources to even get meals for two times. Doctor has advised Nasir to undergo Hernioplasty for his permanent relief but in this condition, it is impossible for him to pay for his expensive surgery. He is praying everyday for a miracle to happen which could cure him and bring back his family’s happiness. While this family was left with no hope for Nasir’s recovery, a kind man referred them to Transparent Hands. Nasir is now scheduled for his hernioplasty in a few days at Abid Hospital, Mian Channu. Nasir and his family direly need our support to live. Please make a donation for his surgery to save his life and his family.